Now before we proceed, just note that this gizmo is targeting a very specific demographic – and by that, we really emphasize on specific. Well, if happen to consider yourself as a weather nerd, you know, if you’re glued to the TV set watching the meteorologist doing their thing or constantly scoping the Weather Channel, then the Netatmo Urban Weather Station is going to fit right into your neighborhood. But then again, for the majority of people out there, it might be something perceived to be an overpriced forecasting machine, which as we all know, our smartphones can tell us that out of the box by looking it up with the appropriate app. 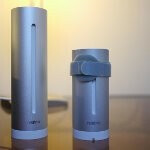 Comprised of two aluminum cylinders with a slit smacked dab right in the center area, the longer one is used indoors with the shorter one is for outdoors, they basically collect various weather data, which can then be read with the Netatmo app for iOS. At first glance, the main Netatmo cylinder has a cool aura to it, seeing that the center piece glows a specific color whenever the top surface is touched – the color it produces (red, yellow, and green) indicates the current indoor air quality condition. Sure, it’s neat that it glows and you can instantly tell if you’re surrounded by too much CO2, but seriously, that’s the extent of this contraption. In all fairness, the Netatmo Urban Weather Station also measures other indoor and outdoor environmental elements such as temperature, humidity, air pressure, and even the noise level. Frankly, it’s a bit strange for a weather oriented device to measure indoor noise level, but heck, that’s included with it. With the shorter outdoor Netatmo monitor, it’s actually meant to be placed outdoors (near a window or something), so it can gather the appropriate information and beam it over to the main monitor. Honestly, the setup process was a complete nightmare, as the app continuously crashed whenever we tried connecting our iOS device to the main Netatmo monitor. After a process of deduction, we figured out that we needed to disconnect from a Wi-Fi network in the first place. Once all of the hassle was out of the way, we were finally transported to the app’s main hub, which we have to say is well done with its presentation and layout. In the end, it’s really difficult to justify paying the $180 to get the bare weather essentials – like knowing the temperature and current weather condition. Of course, you can merely accomplish the same task by running any weather app (even the native one), but then again, it doesn’t offer the localized information that the Netatmo offers. Unless you’re absolutely concerned about knowing every minute detail about the weather condition at a specific location, you’re not going to find much value in the Netatmo Urban Weather Station. $180 for something to tell you the temperature? Some people will think you’re nuts, but hey, it’s something more than that to the correct set of individuals.